Imagine if you could take any sound, separate it by frequency bands, change the filter type and then individually process those bands with delays. 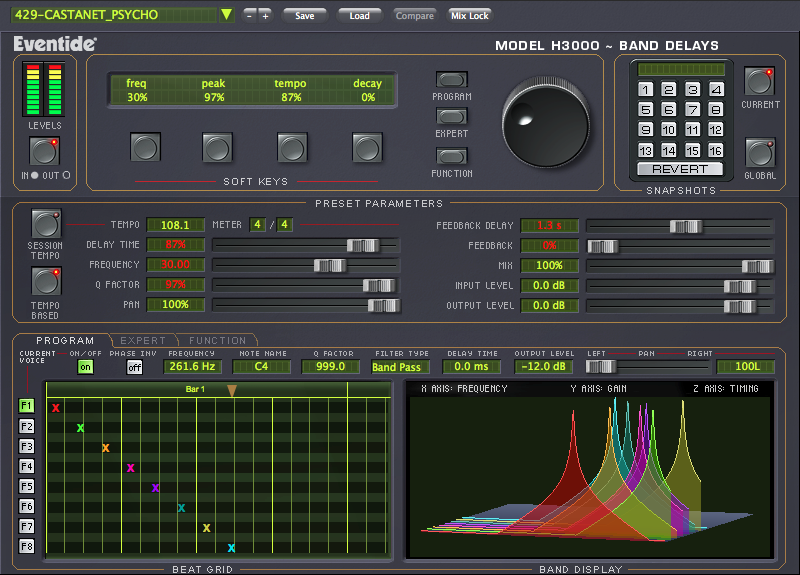 The H3000 Band Delays plug-in is derived from the H3000 Harmonizer® studio processor. This unique plug-in is capable of everything from standard delays and filtering, to stereo-widening and killer rhythmic effects. Filters assignable as band pass, low pass, high pass, all pass or notch filter. Create momentum and bring new life to drums and stringed instruments. Excellent for unique vocal delay effects that don’t fill up the mix. You can add new rhythmic textures to guitars and other instruments. Play the filters as chords in the key of the song to elevate the melody with complex harmonics. Use the function generator to create timed rhythmic delays that sync to tempo. Build complex textures to evoke everything from ethereal to haunting moods. Create wholly unheard of sonic landscapes using multiple filters and delays at once. Morph existing melodies with new vibrant motion. Add flavor to drums with previously unheard rhythms. Play the effect in real time. The H3000 Band Delays is what the title implies... it causes bands not to show up on time.